Soft shelled crabs are among the most highly recommended seafood delicacies found in the USA. This unique product is a form of the Atlantic blue crab, also known as the hard crab. Like all crustaceans, blue crabs shed their outer shells periodically as part of their growth process. This process (called molting) occurs many times during the crabs life cycle. 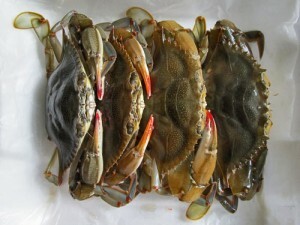 The bulk of American soft shelled crabs come from the Chesapeake Bay region, North Carolina and other coastal areas. From spring thru fall, watermen in these areas harvest soft shelled crabs for local and worldwide markets. Occasionally crabs are in the soft shell stage when captured, but most are caught as “peeler crabs”. Known in some areas as “shedder crabs”, a peeler crab is an individual that is ready to shed its hard shell. In some areas, peeler crabs are held in special containers until they shed their shells. Once they reach the soft shelled stage, most soft crabs are boxed and rushed to markets while alive. Some crabs are processed and frozen rather than shipped live. Live soft crabs must be prepared prior to cooking. Using scissors, the gills, eyes, mouth parts, and apron are removed. Afterward, the crabs should be rinsed and drained well before cooking. Soft crabs are traditionally served breaded and fried, although several cooking methods can be used. Soft crabs are often sold according to local market names, with exact shell sizes varying considerably by season and region.